For years, a self-made real estate magnate named Edul Ahmad personified the collective dreams of Richmond Hill, Queens, which is populated by many immigrants from Guyana, in South America. Mr. Ahmad drove a yellow Lamborghini, sponsored a cricket team and held white-glove parties at a lavish banquet hall that he owned. Edul Ahmad, left, with former Gov. Eliot Spitzer, right, and others in 2006, is accused of masterminding a $50 million mortgage fraud. Many of his clients were immigrants, including Paban Saha, far right, in front of a home he and a friend bought from Mr. Ahmad. Paban Saha, standing in front of a home he bought from Mr. Ahmad with a friend. 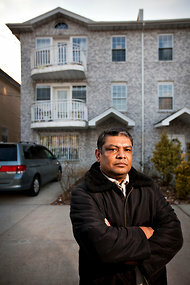 Many of Mr. Ahmad's clients at his real estate business in Queens were immigrants. At a prominent intersection near the border of Richmond Hill and South Ozone Park, his smiling face looked down from a large billboard that promoted his real estate services. Many residents responded, taking out high-risk mortgages that they were told they could readily afford. In July, it all came crashing down. Agents from the Federal Bureau of Investigation arrested Mr. Ahmad, charging him with masterminding a $50 million mortgage fraud that seemed to exemplify a nationwide phenomenon of celebrated immigrant brokers who were accused of preying on their own. Now, scores, if not hundreds, of Guyanese immigrants are facing financial ruin because of loans said to have been arranged by Mr. Ahmad, and the repercussions from the case have extended from Queens to Washington to Guyana. Mr. Ahmad is currently engaged in intensive plea-bargain negotiations with federal prosecutors, according to court documents, but it appears that the impact of the loans will endure for years. Richmond Hill has been hit harder by the foreclosure crisis than most other neighborhoods in the city, officials and analysts said. Mr. Ahmad’s case has also ensnared two politicians whom he considered friends: United States Representative Gregory W. Meeks, a Queens Democrat, and John L. Sampson of Brooklyn, the Democratic leader of the State Senate. A House ethics panel is investigating Mr. Meeks for failing to disclose that he received $40,000 from Mr. Ahmad. Mr. Sampson worked as Mr. Ahmad’s lawyer and was disciplined by the New York secretary of state for notarizing a document for Mr. Ahmad without a license. Guyana is a small nation bordering Venezuela where the largest ethnic group is of Indian descent. After Mr. Ahmad’s arrest, the ruling party in Guyana had to explain why his contact information appeared on a flier promoting a fund-raising dinner with the president at the time, Bharrat Jagdeo; the party said Mr. Ahmad was a friend of Mr. Jagdeo’s, but not a campaign donor. Mr. Ahmad, 44, is charged with luring buyers into subprime mortgages, inflating the values of their properties and concealing his involvement by using straw buyers, like his wife and the Guyanese-born captain of the United States cricket team, Steve Massiah. Mr. Ahmad pleaded not guilty and posted $2.5 million in bail in July. Reached by telephone recently, he would not comment. Since 2009, more foreclosures have been filed in Queens than in any other borough, according to the Neighborhood Economic Development Advocacy Project. Five of the hardest hit ZIP codes in Queens are within a 15-minute drive of the office of Mr. Ahmad, who community leaders say once held about 75 percent of local real estate listings. Paban Saha and Syed Husain, friends and former business partners, said they contacted him in 2006 after seeing his newspaper advertisements. They said he earned their confidence at their first meeting, when they watched him write a check to a charity. “He set up an atmosphere where you forgot about everything,” Mr. Husain, 56, said. Mr. Ahmad and one of his brokers offered Mr. Husain and Mr. Saha a three-family house for $880,000 but warned of another bid, Mr. Husain said. Mr. Ahmad demanded that they close within a week, insisting they use his lawyer, his appraiser and his mortgage officer, who pushed to finance 95 percent of their home at a 12.5 percent rate, Mr. Saha and Mr. Husain said. Within two years, their finances were devastated, they said. The property was on the brink of foreclosure, the souvenir store that their families owned together went bankrupt, and they depleted savings they had accumulated since emigrating from Bangladesh in the 1990s. Some Guyanese people, describing their foreclosures linked to Mr. Ahmad’s services, said they were so terrified by his powerful ties that they did not want their names publicized. One man said that at times he felt suicidal. Housing experts say these cases have cropped up in immigrant enclaves across the United States, often because immigrants can be too trusting of business leaders from their own communities who hold themselves up as examples of classic American success stories. In September, a Bolivian-born woman became the third member of her family in San Francisco to be charged with defrauding Latino immigrants in a multimillion-dollar mortgage scheme. Los Angeles’s Thai community was victimized, community leaders said, by a prominent loan officer who cheated so many immigrants that after he came under scrutiny, he fled to Thailand. Mr. Ahmad worked as a police detective in Guyana before joining a Guyanese immigration wave to New York City in the early 1980s. A private portion of his Facebook profile, accessible by more than 250 of his friends on the Web site, states that he earned degrees from Baruch College in Manhattan. However, the college has no record of him. Even today, after the arrest of Mr. Ahmad and at least 12 Guyanese real estate workers, most of whom were accused of running similar but smaller-scale schemes, there are more than 30 real estate businesses on the main thoroughfare, Liberty Avenue. Mr. Ahmad created a public brand, plastering his photo in advertisements in ethnic newspapers and buying television infomercials. Residents flocked to him. As he accumulated wealth — one former friend said he was worth at least $20 million in liquid assets — he poured money into charitable and other causes, including the mosque where he prays. He also raised money for politicians like Mr. Meeks and Mr. Sampson. “Ed used to go around saying he’s befriended politicians, and if he’s ever caught, they’ll help him get off,” said Chuck Mohan, who is the president of a Guyanese civic group in Queens and a friend of Mr. Sampson’s. Mr. Meeks has said the $40,000 that he received from Mr. Ahmad was a loan, which he paid back, he said, three years after he received it, after the F.B.I. began questioning Mr. Ahmad. Mr. Meeks’s office did not respond to a phone message. At one point, Mr. Sampson used a staff member to aid in his legal representation of Mr. Ahmad, potentially violating ethics laws, according to state records. Asked for comment, Mr. Sampson’s office would say only that he and Mr. Ahmad remained friends. In Queens, many people who once jockeyed for Mr. Ahmad’s attention, like radio and television talk show hosts, are keeping their distance. But his defenders questioned why the government was prosecuting immigrant brokers even as it bailed out banks. “We are innocent victims of the economic frenzy and implosion that America is going through,” said Kawal Totaram, a real estate lawyer and friend of Mr. Ahmad’s. Some housing advocates disagreed that Mr. Ahmad was in trouble because of forces outside his control. Mamta Gurung, a manager at Chhaya, a Queens-based housing organization that caters to South Asians, said half of her foreclosure clients were Guyanese, including some who had loans from Mr. Ahmad. She said most of her clients could not identify their mortgage documents. Some could not spell their names. “It’s quite scary,” she said. Mr. Saha and Mr. Husain, who took the 12.5 percent loan arranged by Mr. Ahmad, said their lives remained in turmoil. They have been unable to start a new business because of a lack of capital, Mr. Husain said, and Mr. Husain’s three children are supporting him financially. That, Mr. Husain said, is not how life should turn out. Copyright 2012 The New York Times Company. Reprinted from The New York Times, New York Region, of Monday, January 9, 2012.